How the Crayons Saved the Rainbow by Monica Sweeney, illustrated by Feronia Parker Thomas, is a delightful book that will remind young readers of their own drawings with pencil and crayons. The sun and clouds are best friends, but one little disagreement puts them at odds and drains the colors from the world. A forgotten box of crayons in a desk draw escape and are appalled at the doom and gloom of grays, blacks, and whites. They set forth creating rainbows to restore some cheer. When they see that their efforts to get the attention of the sun and clouds goes unnoticed, they strive to make their displays bigger and better. Like children looking for attention, their efforts often get bigger and more ostentatious, often pushing the buttons of their parents. However, this is not the same. These crayons are developing gorgeous rainbows and make one of the biggest to get the sun and clouds to remember their own fondness for making them. 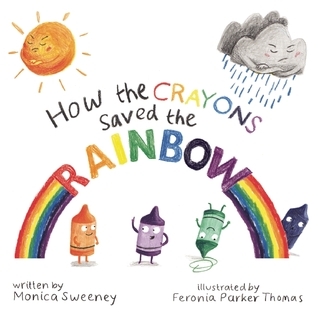 How the Crayons Saved the Rainbow by Monica Sweeney, illustrated by Feronia Parker Thomas, aims to demonstrate how children can have disagreements with one another, but how those disagreements can be overcome and resolved without coming to blows. 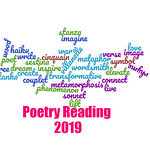 The illustrations will capture the attention of young children easily and may incite them to create their own rainbows. My daughter has been drawing them for several weeks since reading this one. Glad that you both enjoyed the book! The “Crayons” books look adorable to me! There are so many of these…out there. This sounds like a real winner! I love that this book has inspired your daughter to draw colorful rainbows.